the really serious campaigning is underway, it can be informative to take a look past elections for lessons that we can use today. As the 1940 Presidential Race was contested, WWII was already underway in Europe. Popular sentiment in the United States was that we should have nothing to do with the European War, after all, America was still recovering from the Great Depression. Republican Candidate Wendell Wilkie was quite vocal in criticizing incumbent candidate Franklin D. Roosevelt for not doing enough to end the Depression. Looking back from the perspective of history, we know that America was soon to face some of her finest hours in WWII, and then leading the Free World in the Post War Years. One of the biggest lessons we can learn from the 1940 Election is America’s ability to find something to laugh at when it truly needs it. 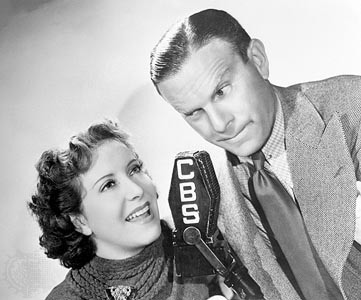 According to political legend, one evening in the Hollywood Home of the country’s most popular radio couple, Gracie Allen sat her knitting aside and informed her husband, George Burns, that she had grown tired of knitting, so why didn’t she run for President? Other sources give George sole credit for the idea, while others attribute it to a brainstorming session with the Burns and Allen Show writers. Where ever the idea actually came from, Gracie’s candidacy became an incredibly successful running gag, so successful that one show could not contain it! With the popularity of the Burns and Allen program, it was not long before the campaign took on a life of its own. 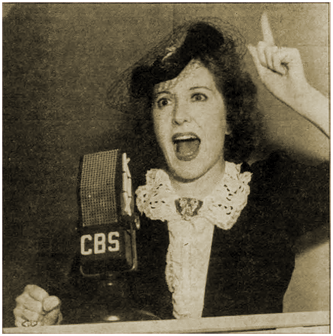 The following week Gracie showed up on the Jello Program to ask Jack Benny and Mary Living Stone for their votes, and later interrupted Fibber and Molly cleaning the closet. The running gag would have probably run its course over a couple weeks, had the upstanding citizens of Omaha, Nebraska, not hit upon the idea of inviting Gracie to hold the Surprise Party Convention in conjunction with Golden Spike Days in Mid May. The Golden Spike celebrates completion of the Trans-continental railway, and the Union Pacific got into the act by offering a train for a whistle stop campaign on the way from Los Angeles to Omaha. Support from the Union Pacific was no small matter. George and the rest of the show were highly enthused about the whistle-stop tour. Mrs. Roosevelt had invited Gracie to speak at the convention of the National Women’s Press Club. If this was a move by the incumbent administration to quiet the competition, it backfired. Among other things, while in Washington Gracie promised to change the city from “D.C.” to “A.C.” so that the electric clocks would work properly. As she returned to Los Angeles, Gracie became more unsure about the Whistle stop campaign. The problem was stage fright. When she was on the stage, the lighting caused enough glare that she was performing for an audience she could not see. The situation was the same on Radio. The difference between an audience that she could see, and one she could not became acutely real as the Union Pacific’s Campaign Special got ready to leave Union Station. As the train left the station Gracie retired to the Parlor car determined that the train had just become an express. George and other friends on the train finally convinced her to make a final effort in Riverside. The good humor and enthusiasm of the Riverside crowd won her over, and the tour wound its way to Omaha. After the convention, Gracie seems to have lost enthusiasm for campaigning. Perhaps she realized that she was becoming a distraction in what was one of the most crucial elections in the history of the nation. Perhaps she had simply become bored with the whole thing. Gracie’s announcement that she was going to stop campaigning was perhaps the most serious speech of the whole campaign, out of recognition for what the real candidates were enduring. This entry was posted in Gracie Allen and tagged Gracie Allen for President. Bookmark the permalink.